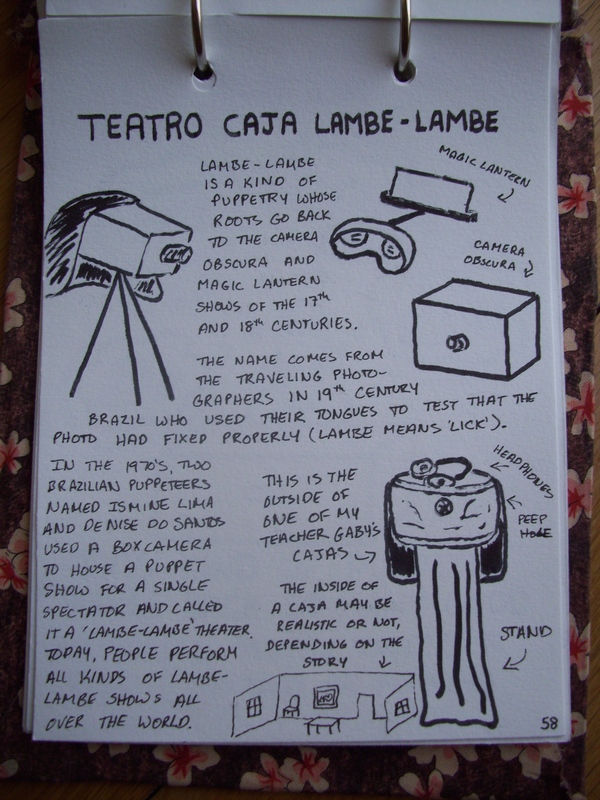 In 2012, I visited Argentina for the first time and I was fascinated when Mara Ferreya, a puppeteer from Cordoba, described a kind of street puppet show that took place in a box. She showed me a photograph, with three people all wearing headphones and looking through their own peephole at some invisible show inside a cardboard box. It didn’t look that hard to make. Later that summer I made my first attempt at a similar show. I called it the Personal Puppet Show and performed it at farmer’s markets and community events. 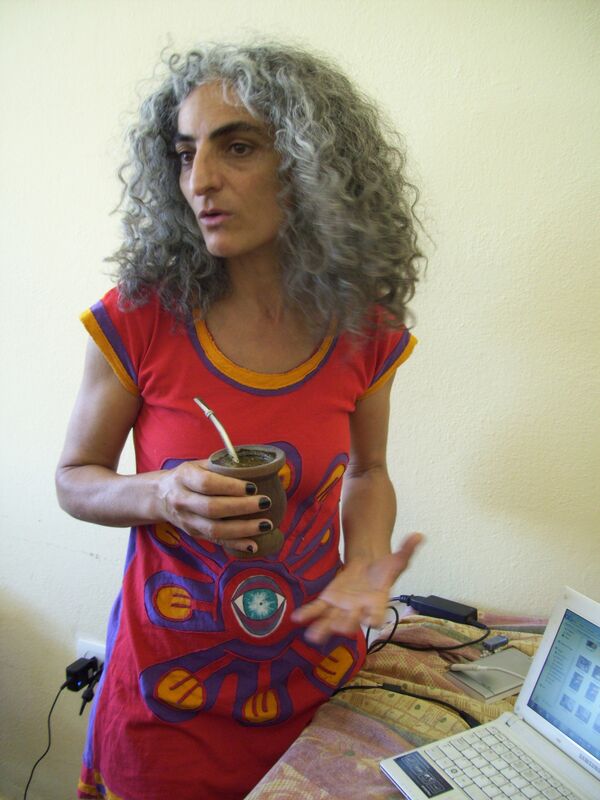 People liked it, but it was only after I went back to Argentina two years later and took a workshop with Mendoza puppeteer Gabriela Céspedes that I realized all of the things I had done wrong. Here is a list of them. 1. The box is too shallow. I could only see one side of the box in Mara’s photo and I didn’t realize it had to be a certain depth. 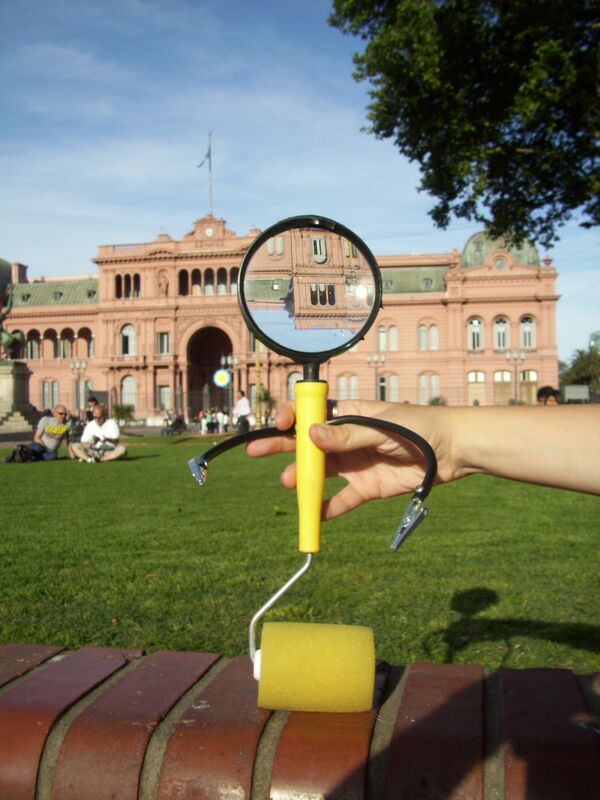 Part of the magic of caja lambe-lambe is that the tiny peephole creates a forced perspective for the viewer. This gets ruined, however, if the box isn’t deep enough and the puppets end up too close to the eye. My box is only about 6-8 inches deep which is great for transport, but not for creating a forced perspective. 2. There are two eyeholes instead of one. This was purely me trying to be fancy. I thought two eyeholes would make it easier to see inside, but it’s actually the opposite. Because everyone has a slightly different distance between their eyes, some people find it much harder to focus, looking through two holes. One peephole per viewer works the best. 3. There is no viewfinder for the puppeteer. Another detail that I missed because I only saw a photo. There should be some kind of window in the back or the top of the box so that the puppeteer can see what they are doing. Otherwise, movement becomes imprecise and easy to mess up. Without a viewfinder, my puppeteering isn’t as good as it could be. 4. 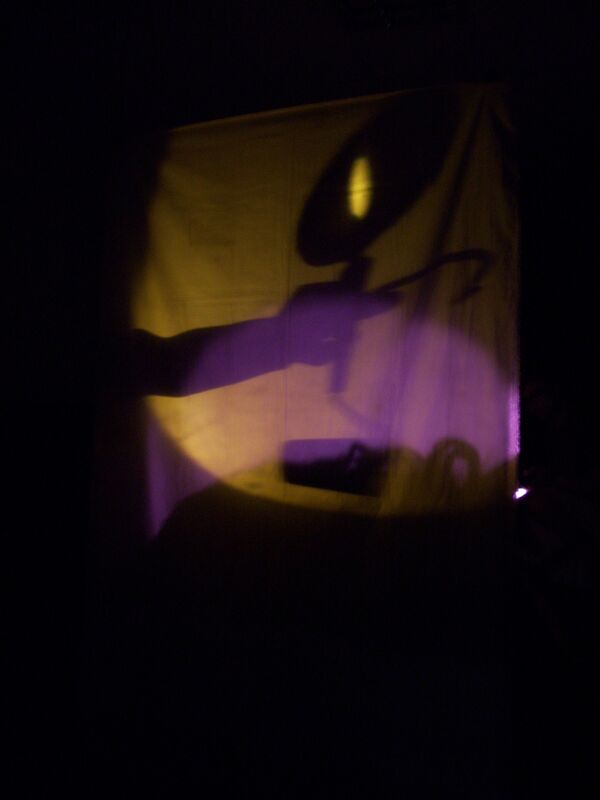 There is a curtain at the back, instead of holes for the puppeteers hands. Another mistake that causes practical problems for puppeteering. Trying to smoothly move my hands (and puppets) between pieces of fabric is difficult and it’s easy for the cardboard puppets to get stuck. This creates a jerking motion as they enter the scene, which ruins the illusion of movement. 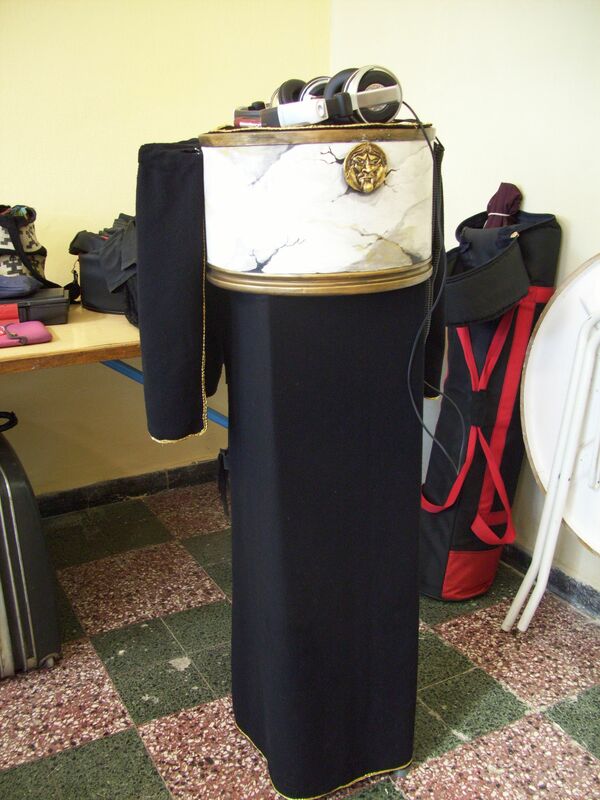 Most boxes have holes for the puppeteer’s hands either at the back or the side, with a curtain over the top to block the light spill. It is much easier to place a puppet in front of this curtain and then enter the box, rather than trying to do both those movements at once. Another option if your puppets are on vertical rods is to cut the holes in the top of the box and bring the puppets in from above. 5. The box isn’t created with a single show in mind. This is the biggest mistake I made, and it’s arguably the one that takes the Personal Puppet Show out of the category of caja lambe-lambe. A true caja show is a miniature world, one that is constructed for the purpose of telling one short, 1-3 minute story and that story alone. The walls, the floor, the ceiling, the puppets, the soundtrack–all of these should combine to create the illusion of a complete setting. My box, with its one-color walls, black curtain background and plain floor does not do this. 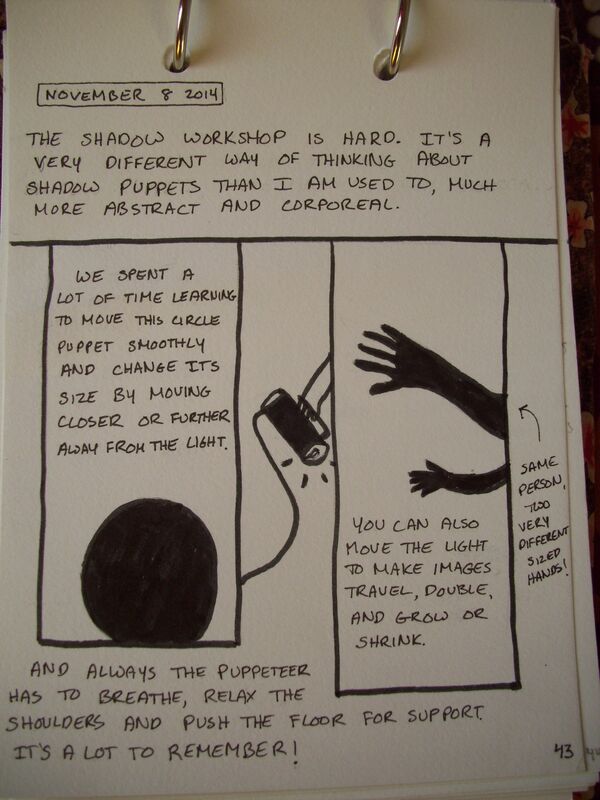 Despite (or perhaps because of) my many mistakes, I enjoyed building my Personal Puppet Show and felt very much at home with the style of puppetry. After studying with Gabriela Céspedes and building a second show as part of the 2015 Fringe project I Thought the Earth Remembered Me I was only more convinced. This year, I’m looking forward to premiering my third caja show, called Library Love and demonstrating how much I’ve learned since I first built the Personal Puppet Show. Cecilia is back from South America, but here is one last postcard, to wrap up her adventures and look ahead to the future. Thanks for following along–we hope you enjoyed this virtual look at far-off places! 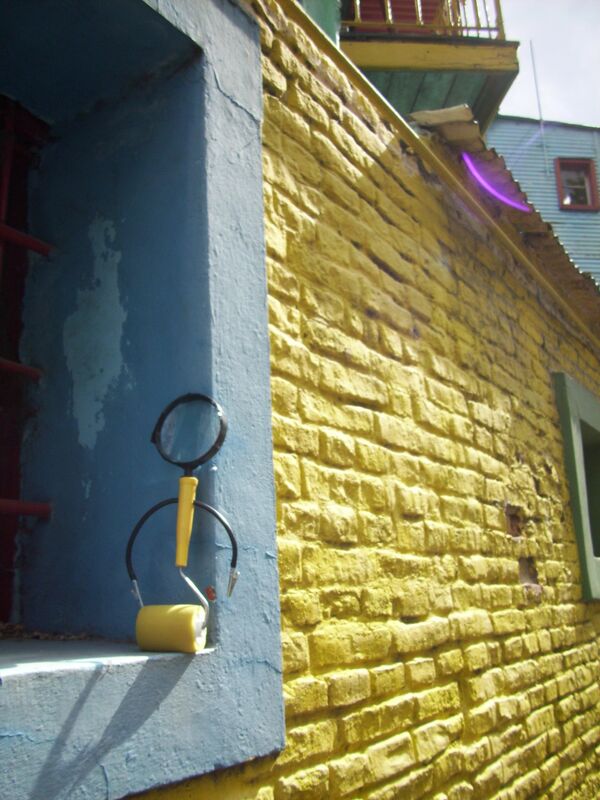 Wit’s End artistic director Cecilia Cackley is currently traveling in South America. 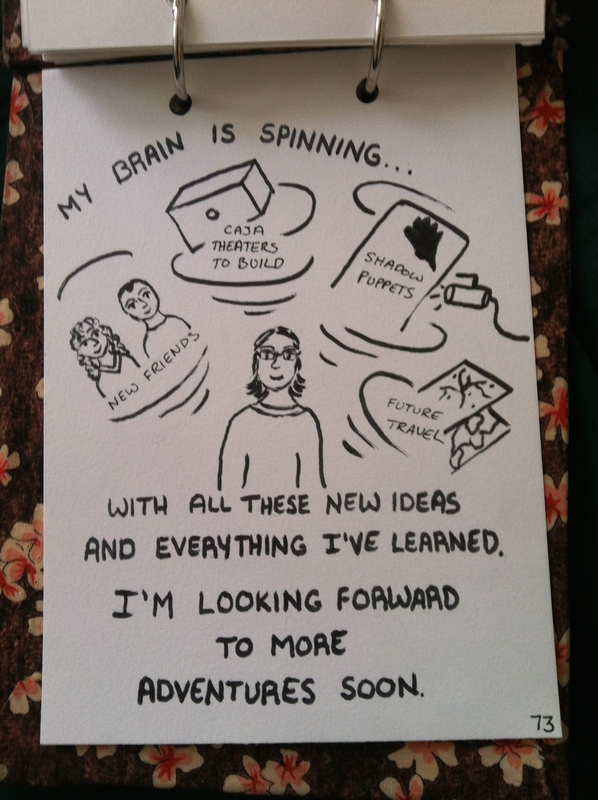 While she is gone, Cecilia is keeping a visual journal of the places she visits and shows that she sees. She will be posting pages here occasionally as virtual postcards from her trip.